SUPER NEAT COCKTAIL NAPKINS! 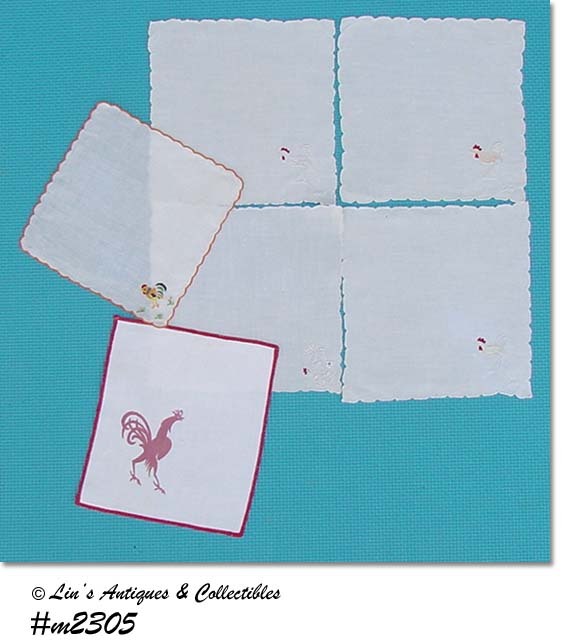 THERE ARE 4 IN THIS LISTING AND EACH HAS AN EMBROIDERED ROOSTER IN ONE CORNER. AS WITH ALL MY LINENS, THESE NAPKINS HAVE BEEN LAUNDERED, LIGHTLY STARCHED, AND IRONED. THERE IS A VERY LIGHT SPOT ON ONE NAPKIN THAT DIDN’T WASH OUT DURING NORMAL LAUNDERING (I DO NOT USE BLEACH OR PRE-SOAK). NAPKINS HAVE BEEN PRICED TO REFLECT THIS MINOR IMPERFECTION. AREN’T THESE JUST THE CUTEST NAPKINS! THEY ARE COCKTAIL SIZE (7 ¼” X 5 1/8”) AND ARE IN EXCELLENT CONDITION! 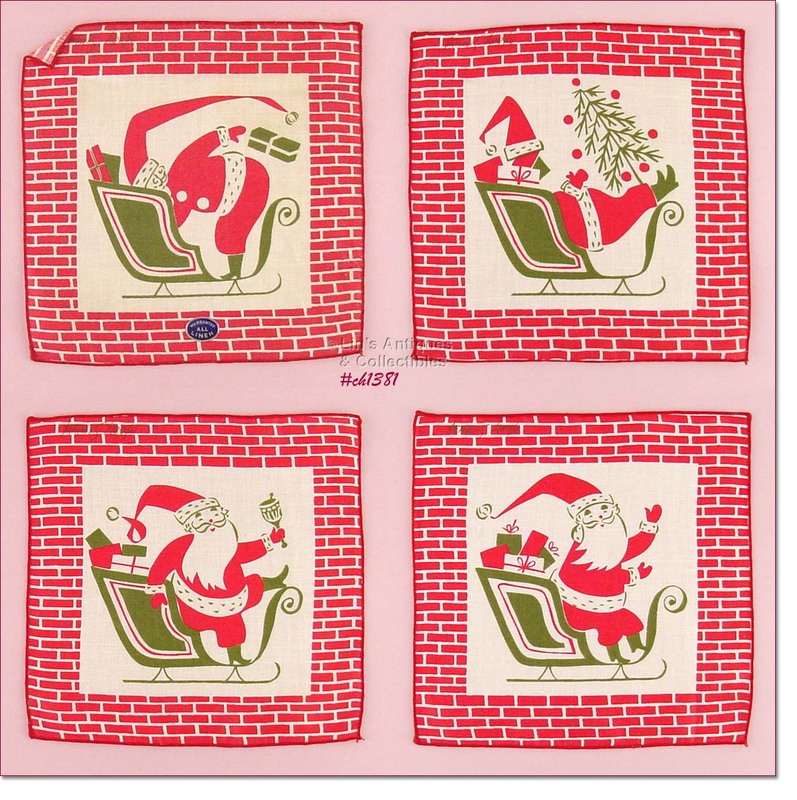 THIS IS A SUPER FIND – A SET OF 8 TAMMIS KEEFE CHRISTMAS COCKTAIL NAPKINS STILL IN THE ORIGINAL BOX BOTTOM! NEVER USED, THERE ARE 4 DIFFERENT DESIGNS AND EACH HAS A BORDER THAT LOOKS LIKE RED BRICKS. THE CENTER DESIGNS ARE OF SANTA IN A SLEIGH SEARCHING THROUGH THE PACKAGES, SANTA SLEEPING, SANTA RINGING A BELL, AND SANTA WAVING. EACH NAPKIN MEASURES 7 ¾” X 7 ¾”. THE TOP NAPKIN IN THE BOX STILL HAS PAPER LABEL “WARRANTED ALL LINEN”. THE LID TO THE BOX IS MISSING. VERY COLLECTIBLE AND DIFFICULT TO FIND ITEMS! 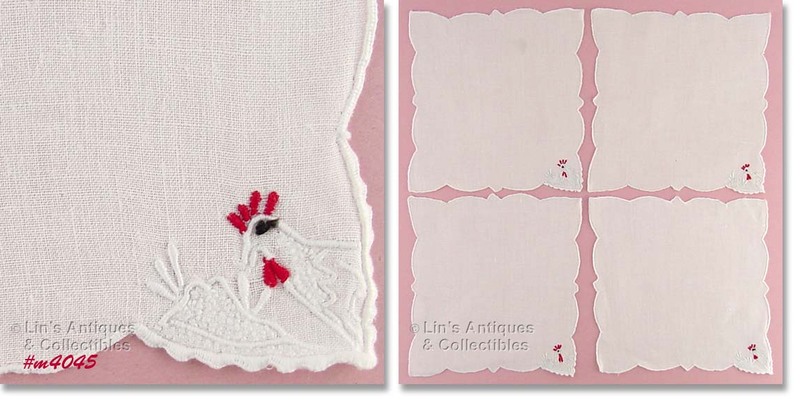 SET OF 4 QUALITY LINEN NAPKINS WITH AN EMBROIDERED FLOWER IN EACH CORNER! NAPKINS MEASURE 10 ¼” X 10 ¼”. SUPER! 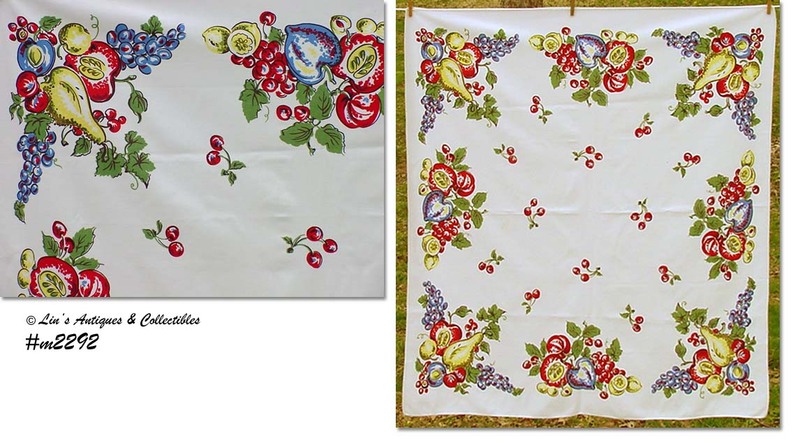 SUPER NICE MADEIRA LINEN PLACEMATS AND MATCHING NAPKINS! THERE ARE 8 PLACEMATS AND 8 NAPKINS. PLACEMATS MEASURE 16 ¾” X 11”. NAPKINS MEASURE 14 ¼” X 15 ¼”. NICE TO USE OR WOULD BE A WONDERFUL GIFT FOR ANYONE WHO APPRECIATES QUALITY LINEN ITEMS! AREN’T THESE PRETTY? 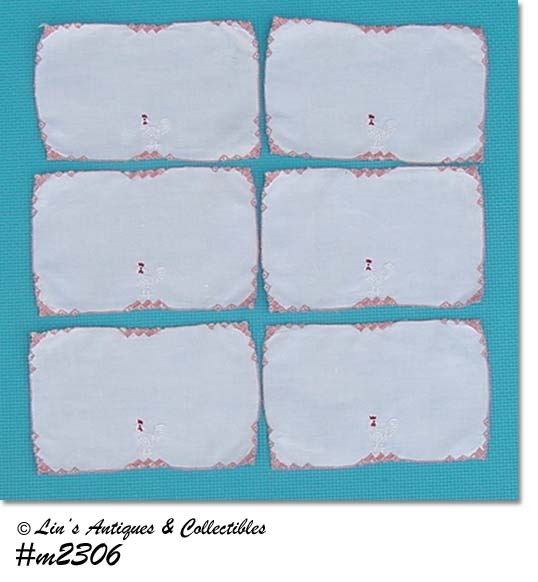 THERE ARE 10 DINNER NAPKINS IN THIS LISTING, MEASURE 14” X 17”, AND HAVE A SUPER CHRISTMAS PATTERN! ALL ARE IN WONDERFUL CONDITION – NO HOLES, TEARS, OR SNAGS. I LAUNDERED THEM BUT DID NOT PRE-SOAK OR SPOT-TREAT AND WHEN IRONING, I NOTICED A FEW LIGHT YELLOW SPOTS ON SOME OF THEM – MAY BENEFIT FROM A NON-CHLORINE BLEACH WASH.
NEAT SOUVENIR OF ALASKA – A LUNCHEON SIZE TABLECLOTH! IT MEASURES 33” X 36 ¼” AND IS IN EXCELLENT CONDITION. IT HAS A STRAY YELLOW COLOR DOT ON THE WHITE BORDER (PRODUCTION). VERY COLORFUL! I PURCHASED THIS LUNCHEON SET SEVERAL YEARS AGO AT AN ESTATE SALE. ONE NAPKIN DOES NOT HAVE THE PAPER JAPAN STICKER/LABEL -- THE LABELS STATE “MADE IN OCCUPIED JAPAN”. SET CONSISTS OF A LUNCHEON SIZE TABLECLOTH (32 ½” X 33”) AND 4 NAPKINS (10 ½” X 11”). ALL ARE IN EXCELLENT CONDITION! ISN’T THIS A LOVELY TABLECLOTH? THE COLORS AND PATTERN ARE SO PRETTY – A WHITE TABLECLOTH WITH AQUA/TEAL COLOR POPPIES IN BOUQUETS WITH WILD FLOWERS. IT MEASURES 64” X 51” AND IS IN EXCELLENT CONDITION. FRESHLY LAUNDERED, LIGHTLY STARCHED, AND IRONED – IT’S VERY PRETTY! OF THE TABLECLOTHS WE HAVE LISTED, THIS IS ONE OF MY FAVORITES! IT’S A WHITE TABLECLOTH WITH AN ASSORTMENT OF VEGETABLES ALL AROUND THE BORDER AND THEY’RE IN SHADES OF PINK WITH SOME RED AND ORANGE FOR EXTRA COLOR. TABLECLOTH MEASURES 53” X 60” AND IS IN EXCELLENT CONDITION. I HAVE LAUNDERED, LIGHTLY STARCHED, AND PRESSED – IT’S READY FOR USE! THIS IS A LOVELY VINTAGE WILENDUR TABLECLOTH! IT HAS A WHITE BACKGROUND WITH 12 CLUSTERS OF IVY LEAVES AND VINES, MEASURES 68” X 54”, AND IS IN WONDERFUL CONDITION – IT HAS A COUPLE TINY DOTS THAT ARE NOT WORTHY OF MENTION. TABLECLOTH HAS BEEN LAUNDERED (I DID NOT PRE-SOAK OR SPOT TREAT), LIGHTLY STARCHED, AND IRONED – READY FOR USE OR DISPLAY! ANOTHER VERY PRETTY, COLORFUL TABLECLOTH FROM THE 1950’S! THIS ONE HAS AN ASSORTMENT OF BRIGHTLY COLORED FRUITS ON A WHITE BACKGROUND. 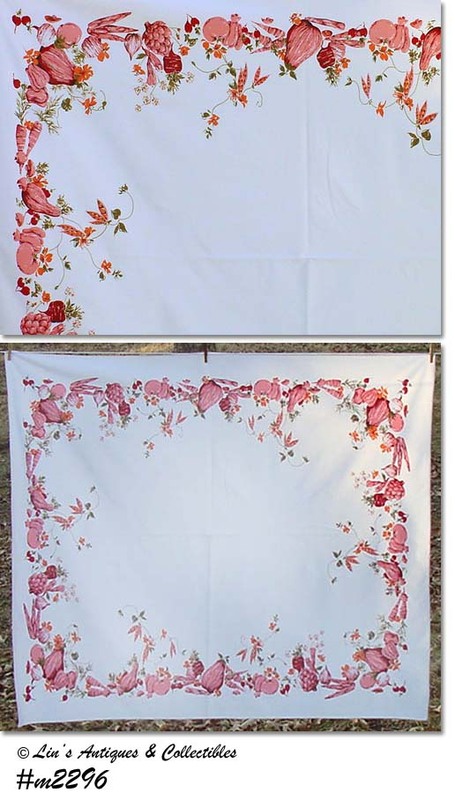 TABLECLOTH MEASURES 50” X 44” AND IS IN WONDERFUL CONDITION WITHOUT HOLES, TEARS, OR SNAGS. I LAUNDERED BUT DID NOT PRE-SOAK OR SPOT-TREAT AND I NOTICED A SMALL WATER (?) MARK THAT MAY BENEFIT FROM A NON-CHLORINE BLEACH WASH. VERY NICE ITEM! 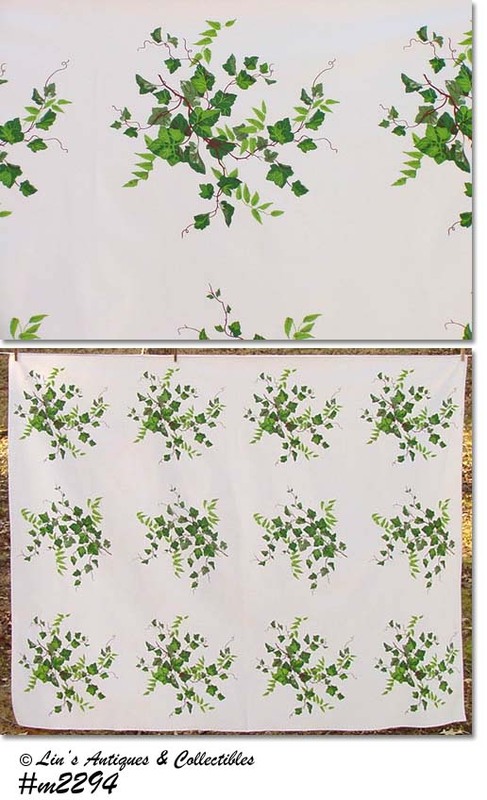 ALTHOUGH THESE BEAUTIFUL TOWELS DO NOT HAVE A WILENDUR TAG, THEY MATCH THE TABLECLOTH WE JUST LISTED! I PURCHASED THEM TOGETHER AND AM CONFIDENT THEY ARE WILENDUR PRODUCTIONS. THERE ARE 4 TOWELS IN THIS LISTING, EACH MEASURES APPROXIMATELY 18” X 34” AND ARE IN WONDERFUL CONDITION – NO HOLES, TEARS, OR SNAGS. AS WITH THE TABLECLOTH, I LAUNDERED BUT DID NOT PRE-SOAK OR SPOT-TREAT AND WHEN IRONING, I NOTICED THERE A COUPLE LIGHT YELLOW SPOTS THAT MAY BENEFIT FROM A SOAK. VERY PRETTY AND COLORFUL! BEAUTIFUL COLORS ON THIS “GENUINE WILENDUR CREATION”! THIS IS THE ROYAL ROSE PATTERN, TABLECLOTH MEASURES 54” X 68” AND HAS THE WILENDUR TAG. IT’S IN WONDERFUL CONDITION WITHOUT HOLES, TEARS, OR SNAGS. I LAUNDERED BUT DID NOT PRE-SOAK OR SPOT-TREAT AND WHEN IRONING, I NOTICED IT HAS A COUPLE LIGHT SPOTS THAT MAY BENEFIT FROM A NON-CHLORINE BLEACH WASH OR SOAK. LOVELY ITEM AS EVIDENCED IN PHOTOS. THIS LISTING HAS SIX VERY COLORFUL NAPKINS BY VERA! THEY ARE LIGHT GREEN (PISTACHIO) COLOR WITH ORANGE POPPIES, MEASURE 16” X 16”, AND HAVE VERA’S SIGNATURE WITH LADYBUG. WONDERFUL CONDITION – NO HOLES, TEARS, OR STAINS! THIS IS A SUPER COLLECTIBLE ITEM THAT’S ALSO VERY PRETTY! LISTING IS FOR A TABLECLOTH FROM THE VERA PRINTS COLLECTION, IT’S WHITE WITH VERY COLORFUL SPRING FLOWERS, MEASURES 60” X 82”, AND IS IN THE ORIGINAL PACKAGE THAT SHOWS ORIGINAL PRICE TAG OF $23.00. LOVELY!! THESE NAPKINS ARE SO NEAT! 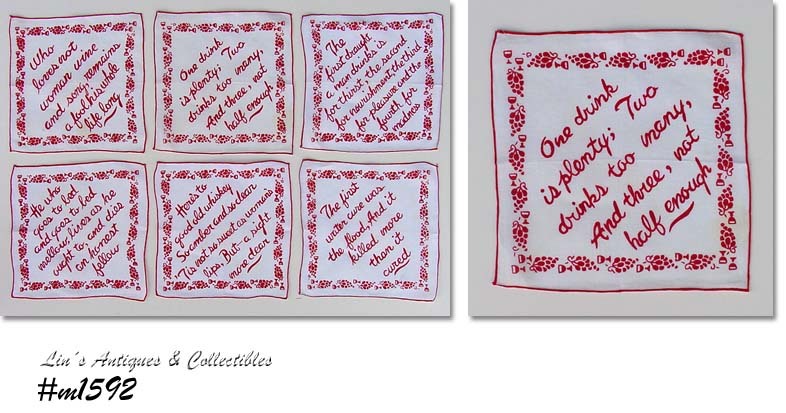 THERE’S A SET OF 6 WHITE WITH RED WINE GLASS AND GRAPES BORDER AND CENTERS HAVE SAYINGS SUCH AS “HE WHO GOES TO BED AND GOES TO BED MELLOW, LIVES AS HE OUGHT TO, AND DIES AN HONEST FELLOW” – ALL 6 ARE DIFFERENT. IN WONDERFUL CONDITION – A COUPLE HAVE A SMALL YELLOW SPOT THAT SHOULD LAUNDER RIGHT OUT (I DID NOT PRE-SOAK WHEN I LAUNDERED THEM). UNUSUAL AND DIFFICULT TO FIND ITEMS. WOW -- RETRO WONDERFUL! THIS IS A LUNCHEON SET STILL IN ITS ORIGINAL BOX. PER BOX: ANOTHER GIFT CREATION BY VICTORY, THE CAT'S MEOW, 10 PIECE LUNCHEON SET, FEATURING THE "MEOWING" SALT AND PEPPER SHAKERS, SHAKE AND HEAR THEM MEOW! LUNCHEON SET CONSISTS OF 4 PLACEMATS, 4 NAPKINS, 2 IMPORTED "MEOWING" SALT AND PEPPER SHAKERS. I DON'T KNOW IF THEY STILL MEOW OR NOT -- I DIDN'T WANT TO OPEN THE PACKAGE. NEAT ITEMS, GREAT COLLECTIBLES!